Ken Schram Photography: How's Your Memory? Regardless of how well you remember things, who can't use more? Especially if you're a photographer! 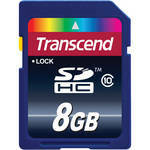 There's a great deal happening over at B&H right now on Transcend 8GB SDHC Class 10 memory cards.